Combine Suzuki’s most powerful and innovative ATV with large-diameter, bush-ready bumpers and you’re ready for rugged outdoor and utility action. 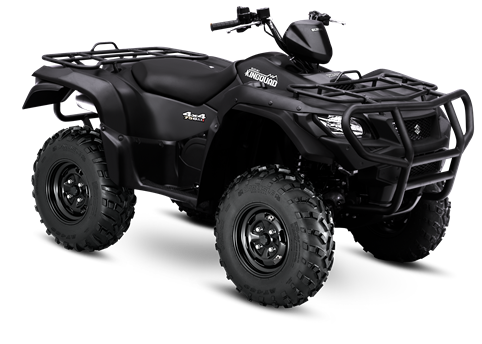 Built in the USA and wrapped in sleek, matte-black bodywork, the extraordinary KingQuad 750AXi Power Steering Special Edition with Rugged Package also sports wide, protective mud flaps to keep the gunk away as you tackle tough trails and tougher jobs. 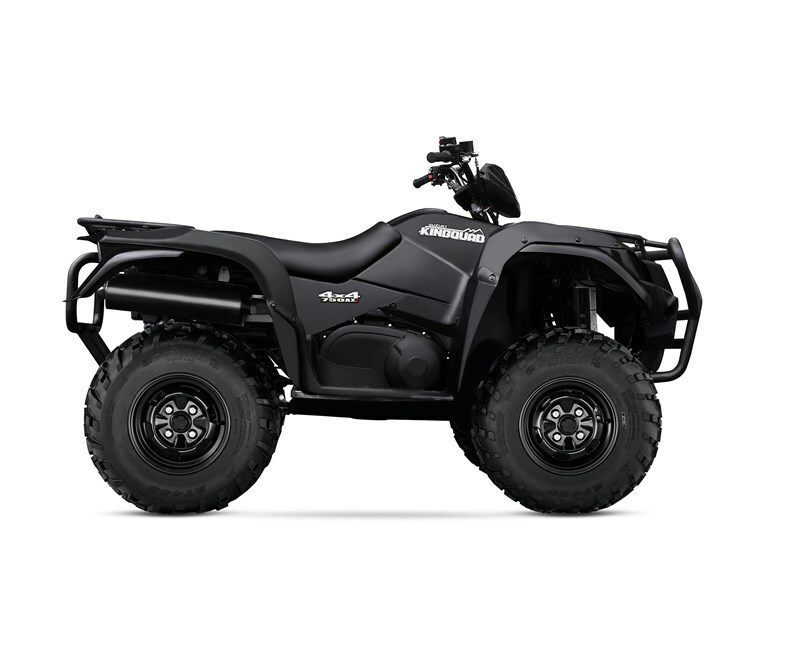 The front bumper is winch and lighting-friendly, while the rear bumper features a square hitch receiver that lets you take advantage of the ATV’s strong towing capacity. Abundant torque developed by the KingQuad’s 722cc fuel-injected engine provides performance that’s standard for Utility Sport ATVs. The advanced power steering system provides responsive handling, reduces turning effort, and damps vibration to the rider, while the advanced chassis lets you float over rough obstacles with ease while still being able to haul or tow what’s needed to get the job done. Stylish bodywork features high-clearance fenders equipped with wide, flared mud guards that offer great protection for the rider from flying debris. Carefully designed body panels simplify maintenance needs, such as oil level checks. Reduced effort from the Power Steering permits higher handlebars for increased rider comfort. 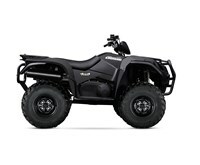 Dual 35W headlights (with high and low settings) are part of the distinctive KINGQUAD grille appearance. Bright tail light help make the ATV visible in dark conditions. Large diameter, oversize bumpers are mounted to the front and rear for maximum protection and utility. The rear bumper features a square hitch receiver that lets you take advantage of the ATV’s strong towing capacity. High-output, three-phase charging system feeds an 18-amp maintenance-free battery for abundant power for easy starting and accessory use. A sealed 12V accessory outlet is standard. The large 4.6 gallon (17.5 L) fuel tank is positioned for a low center-of-gravity. It includes a vacuum-operated petcock and a ratchet-style filler cap (which prevents over tightening so it can be easily unscrewed for refilling). A variety of Suzuki Genuine Accessories are available including winches, windshield, snow plow, aluminum skid pans, rack extensions, utility box and more.